Registration and touring are in full swing at the Ark. We are having such a positive response to all of our program offerings, including extended half day hours! 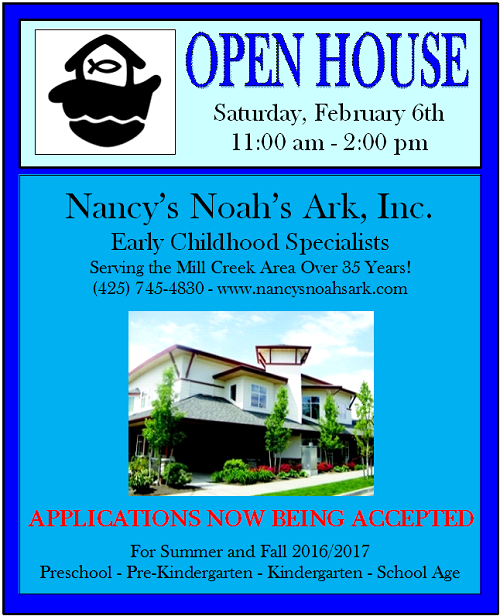 We open our registration to the public on February 15th, and are hosting an Open House on Saturday, February 6th from 11am - 2pm. This is a great opportunity for your family to see our facility, learn about our curriculum and to meet our teachers and staff. This event is open to all families interested in our programs and the whole family is encouraged to come! We hope to see you at this wonderful event! There are currently no comments for NNA Open House.